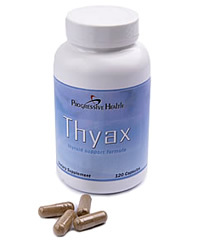 Thyax : Naturally stimulate thyroid function Order Now Online! Naturally stimulate your thyroid function. Thyax is a new supplement that causes your body to naturally increase production of thyroxine and stimulate your thyroid. Since Thyax stimulates thyroxine naturally, it does not have the side effects that conventional thyroxine drugs have - such as headaches, insomnia, bone loss, and rapid contractions of the heart. Your thyroid is a small butterfly-shaped gland in your neck that wraps around the windpipe behind and below the Adams apple area. The hormone in your body that stimulates thyroid function is called Thyroxine and it is the main hormone which is produced in the thyroid gland. Thyroxine helps oxygen enter cells and makes your thyroid the master gland of metabolism. Bringing your thyroid back to normal functioning can be a crucial factor to your health. What Can Thyax do for You?